Intel’s working hard to establish a chiphold in the Internet of Things, as it emphasized in an “IoT Insights” event on Tuesday. But it’s not going to go it alone. Just as Intel’s Xeon chips are built upon an ecosystem of partnerships, standards, and specifications, the company’s forging similar kinds of agreements in IoT—a space dominated by embedded processors that already have a head start on Intel’s Quark and Edison chips. Intel would seem to be operating at a disadvantage. ARM dominates the smartphone business, which is defined by small but powerful processors, while Intel’s Atom chips have struggled to gain traction. In wearables, the challenge is tougher: Processors are smaller and consume even less power. Not surprisingly, then, the IoT markets Intel chose to highlight put less of a priority on low power and more on processing data, an area where Intel excels. Intel used the event to launch a new IoT gateway, a device that will take in data from embedded sensors and devices and feed data to Intel’s data center chips and services. John Gilbert, the chief operating officer of Rudin Management, which operates a network of data centers and other buildings across New York City, described how data centers could actually allocate less energy to cooling as employees left for lunch. Employees generate 100 watts in heat per person, and Rudin saved a dollar per square foot per year in that savings alone—one million dollars per year. That savings opportunity wouldn’t have been detected, let alone realized, without an investment in sensors and analytics, he said. 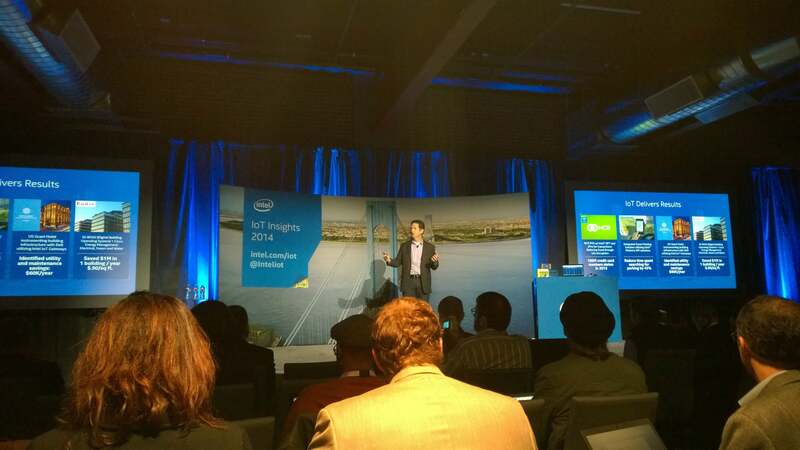 Doug Davis, the head of Intel’s Internet of Things business, at the event in San Francisco. Diane Bryant, the senior vice president responsible for Intel’s data center group, said the increased number of sensors and IoT devices—50 billion devices by 2020—creates a “virtuous cycle,” promoting demand for infrastructure and then analytics for that data, which then spurs growth of more sensors. Intel’s partners, including GE and IBM, recognize this, Intel executives said. But even a company like eBay can use data analysis to zero in on fraudulent transactions, Bryant said. “Big data analytics is the next big technology disruptor,” she said. To her credit, Bryant highlighted a Gartner study that showed that 65 percent of those polled among enterprises simply didn’t understand the value of big data—which could explain why Intel hosted the event. 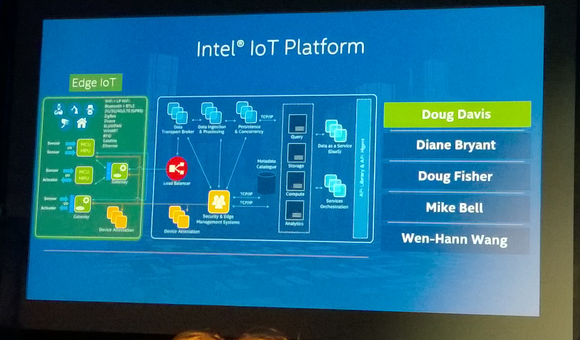 Intel’s platform for capturing the Internet of Things is large, complex, and holistic. Why this matters: While a competitor like ARM might regard the Internet of Things as a market it can dominate with its own embedded chips, Intel is taking a more holistic view: It can dominate the embedded device market via software, its data center technology, and more. It will be interesting to see whether Intel can use these other elements to dominate the market. What should be noted, though, is that while Intel has talked at length about its embedded chips, Quark and Edison, those names were barely mentioned on Tuesday. In part, that’s because Intel was late to the smartphone market—“ten years or so after that train had left the station,” said Patrick Moorhead, president of Moor Insights & Strategy. Moorhead said Intel is making an ecosystem pitch, leveraging the fact that it owns much of the guts of a data center, including the Xeon processors, routers, and switches. What will be interesting, he said, will be the technology that it contributes to partnerships like Fossil and Luxottica. “Luxottica knows nothing about this sort of technology,” he said. 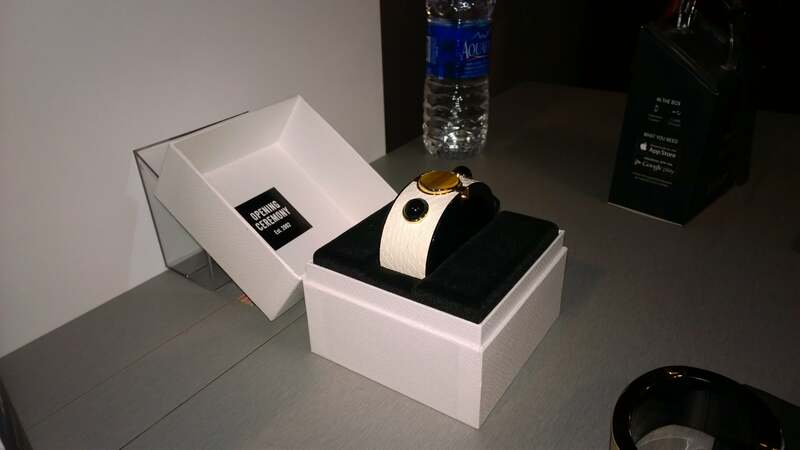 Another of Intel’s partnerships: the MICA smart bracelet with Opening Ceremony. Intel plans to contribute as much of its design intelligence as customers want, executives said. Intel wants to connect devices, secure them, analyze that data, and then try to figure out how to monetize that data. Intel announced two products: a gateway that can be deployed to serve as a central reporting hub for IoT devices and then funnel that data to a server; and software from its Wind River division to manage and configure them. Doug Fisher, general manager of Intel’s Software and Services Group, said it’s Intel’s job to develop programs and tools to allow customers to innovate, rather than Intel itself. “My job is to get out of the way,” he said. “The future of things like smart homes and smart buildings—you heard it earlier—is the sharing of information,” Fisher said. That necessitates partnerships with everything from OpenJDK to Hadoop to Cloudera, both on the device level and at the data center. In between are the APIs that customers can use to translate the data devices transmit into actual data—what Fisher called the “connective tissue.” API management is one of the core capabilities of Intel’s IoT gateway. Wearables, of course, are the most visible face of the Internet of Things: from high-end face-mounted computers like Google Glass, to fitness bands like the Basis smartband that Intel itself bought earlier this year. 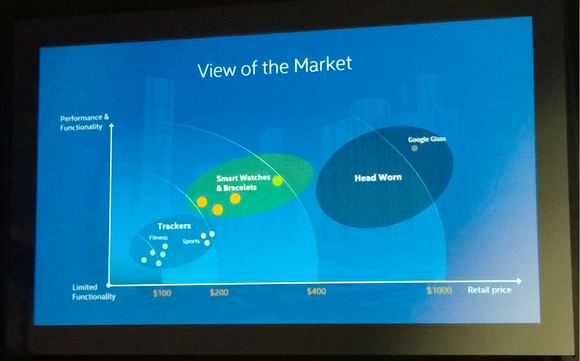 How Intel sees the wearables market. Mike Bell, vice president and general manager of the New Devices Group, estimated that 400 million wearables will be sold by 2020. While Intel sells the Basis Band, the company has forged partnerships with watchmakers like Fossil and eyewear groups like Luxottica to integrate the company’s Edison chips. That’s the way Intel intends to go forward, Bell said: partnering with brands and allowing them to create their own branded portals, quietly powered by Intel’s intelligence. “We consider wearables to be ‘personal IoT,’” Bell said. As wearable technology becomes more personal, they may serve as a form of identification that helps eliminate ID badges, he added. 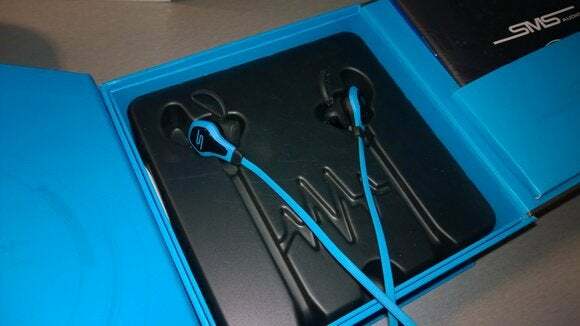 Wen-Hann Wang, vice president and managing director of Intel Labs, said Intel’s research teams are working on ways to harvest power by translating vibration into energy that a wearable can use, while maximizing efficiency in general. Wang also said that Intel had developed and would license what it called enhanced privacy ID technology, which identifies a device as a member of a group, rather than something that’s locked to you, personally. Finally, Intel is working to prioritize video among embedded devices through quality of service, while cutting the power necessary to transmit video. But for now, Intel’s busy nailing down the details. Some have said wearables are just wrist computers. Intel undoubtedly hopes so, because computers are a business it’s winning.